Two years ago, Rafael Negron was on a downward spiral into hopelessness. He had separated from his wife, lost his job and didn’t have anywhere to live. Unable to find work, he started sleeping on friends’ couches. A few months ago, he was staying with the only friend he had left and realized that if he didn’t go to a homeless shelter, he would lose that relationship, too. “When I was younger, I volunteered at soup kitchens, and never did I think I would be on that side of the counter getting food,” he said. One of the hardest things about being homeless, he explained, is dealing with people’s prejudices and overcoming that feeling of hopelessness. A few weeks ago, Negron, 34, was staying at a homeless shelter when he heard about a program that might be able to help him get back on his feet. He contacted Inspiration Corporation, a nonprofit organization headquartered in Uptown near the Wilson Red Line stop. It provides meals, housing, counseling and skills development to about 3,000 homeless or low-income individuals each year. On May 6, Negron and a small group of others began the Inspiration Kitchens training program. They are spending the next 13 weeks learning cooking skills, interning at a local restaurant, and, if they graduate, will be placed in jobs in the food industry. Margaret Haywood, Inspiration Corporation’s Director of Workforce Development, explained that 570 individuals have completed this training since the program began in 2000. The organization helped many of those graduates find work at local catering companies like Sodexo and Foodstuffs, and local restaurants like Mastro’s Steakhouse and Margaritaville. “We’ve had people get hired by a larger company like Sodexo that staffs cafeterias at a number of places – Northwestern, University, places like that – who’ve been very happy with our graduates,” Haywood said. “But the larger the entity, the more HR’ing and lawyering there is going on, and risk management. They don’t like to hire ex-offenders and we’re working with a lot of ex-offenders. The first five weeks of the training program are a blend of intensive classes and practice sessions. The students prepare meals at Inspiration Café, located at the organization’s headquarters, which provides food to individuals enrolled in Inspiration programs. The final eight weeks are spent interning at the Uptown Inspiration Kitchens restaurant located nearby. This cycle begins every five weeks with a new group of students who gain the skills they need to launch their careers in the food industry. Haywood said that the program receives about 50 referrals a month. Those individuals have to demonstrate basic proficiency in reading and math, and agree to the rigorous class schedule. About 25 percent of the individuals who apply for the training are accepted, and 51 percent of those who start the program complete it. Haywood said that one of the biggest challenges for students in the program is learning how to balance their personal lives with the rigors of the food industry. It’s pretty unforgiving, she said: You have to stand for long periods of time, it’s hot, crowded, fast-paced and attention to detail is critical. For some individuals still struggling with the basics, like where they’re going to sleep that night, this can be a challenging workload. “It’s hard to get to class every day, manage your time and be organized when you’re homeless,” Haywood said. “And you’re either staying here or there, or you’re in a shelter. Some of the places they’re staying, they don’t have their own room. The two Inspiration Kitchens restaurants where the students complete their internships, one located in Uptown and the other in Garfield Park, are both managed and run like regular businesses. But what sets them apart is that most of the staff are going through the program, or have graduated from it. Haywood said Uptown, in particular, is a hotspot in Chicago for homelessness because there are so many social services available in the area. While this makes it easier for individuals to seek out different kinds of support – healthcare, counseling, training and housing – it causes tension in parts of the neighborhood where gentrification is occurring. But this isn’t a new problem. Finding ways to support the homeless is a key issue for not only Uptown, but also for the City of Chicago. Analysis completed in July 2012 by the Chicago Coalition for the Homeless found that there were 105,338 homeless people in Chicago during the 2011 – 2012 school year, a 12 percent increase from the previous year. Of that total, Chicago Public Schools reported that 17,255 were homeless students, a 10.7 percent increase from the prior year and the highest number of homeless students ever recorded by the city. Inspiration Corporation has a long and complicated history that began with serving Uptown’s homeless and has grown to include the broader Chicago community. Lisa Nigro, the organization’s founder, began passing out sandwiches to Uptown’s homeless in 1989. 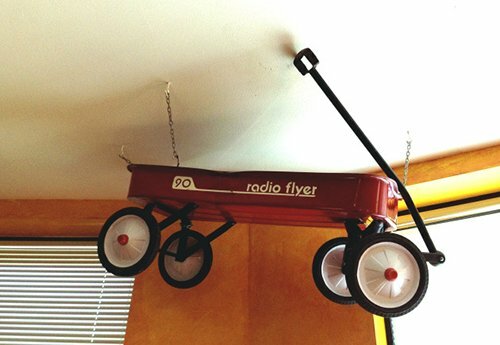 The red Radio Flyer wagon she pulled around the neighborhood now hangs from the ceiling in the corner of Inspiration Café, where today’s program participants meet, mingle, eat and learn. Over time, Nigro traded in the wagon for a van and then a bus. The organization moved into its current building, near the Wilson Red Line stop, and opened a restaurant for the homeless. Eventually, Inspiration Café became Inspiration Corporation, expanding its services to offer case management, housing and skills training. 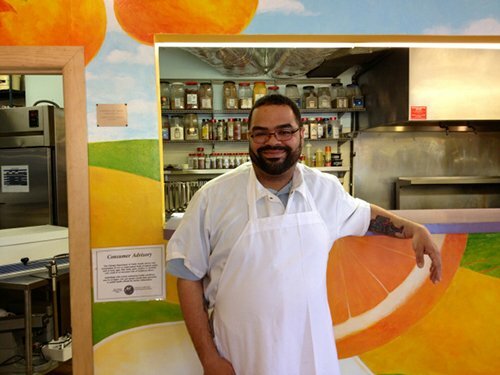 In 2000, it began training homeless individuals for jobs in the food industry. 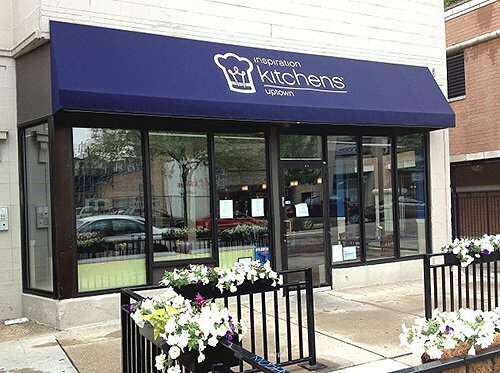 In 2005, the first Inspiration Kitchens restaurant and training center opened in Uptown, and the second Garfield Park restaurant followed in 2011. Negron, too, has history in Uptown. He grew up there as well as in different parts of the South Side. He attended schools in districts with limited funding and in neighborhoods where it was hard not to get involved in gangs and violence. Negron wants to start a nonprofit organization that provides after-school arts programs for youth in low-income communities. He didn’t have the chance to learn an instrument or take creative writing classes in school, so he wants to create those opportunities for kids who may not otherwise be able to explore dance, art, literature, music production and other activities. He also wants to open a soup kitchen and provide services for adults like him dealing with homelessness. The belief driving Inspiration Corporation’s mission is that everyone deserves to be treated with dignity and respect. This resonates with Negron, who said he thinks that the Inspiration Kitchens program isn’t just going to help him get a job and find a place to live. It has also encouraged him to develop goals – to be hopeful again.